Today I was able to go with Bro. Anger, Eric and my brother Titus to Bloomsburg. It was a great day and I was able to preach for the morning service. I preached on the story from Luke 7 about the woman who was a sinner and Simon the Pharisee. It was a really interesting story, one thought in particular which stood out to me was how Simon seemed to have no problem having Jesus over to his house, whereas others in the Bible felt Jesus was too great to even come to their home and then along with that the Pharisee looked down on the one person who humiliated herself in order to reverence Jesus. The application came down to asking each person to look into their heart and see if they have ever come to the place of humbling themselves before God because they see their debt they owe Christ or have they been like the Pharisee who from the passage seemed to not even think he had a debt. 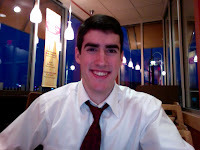 Right now I am at Panera Bread on the internet here waiting till it is time to head back to church and then Brother Anger will preach the evening service and we will sing some songs and such.